The Jordan River (Hebrew: נהר הירדן nehar hayarden, Arabic: نهر الأردن nahr al-urdun) is a river in Southwest Asia flowing through the Great Rift Valley into the Dead Sea. Historically and religiously, it is considered to be one of the world's most sacred rivers, although the meaning and context of the word "sacred" may be ambiguous. The Hasbani (Hebrew: שניר senir, Arabic: الحاصباني hasbani), which flows from Lebanon. The Banias (Hebrew: חרמון hermon, Arabic: بانياس banias), arising from a spring at Banias at the foot of Mount Hermon. The Ayoun (Hebrew: עיון ayoun, Arabic: عيون ayoun), which flows from Lebanon. The four merge to form the Jordan in northern Israel, near kibbutz Sede Nehemya. The Jordan drops rapidly in a 75 kilometer run to swampy Lake Hula, which is slightly below sea level in the Rift Valley. Exiting the lake, it drops much more in about 25 kilometers to the Sea of Galilee. The last section has less gradient, and the river begins to meander before it enters the Dead Sea, which is about 400 meters below sea level and has no outlet. Two major tributaries enter from the east during this last phase: the Yarmouk River and Jabbok River. 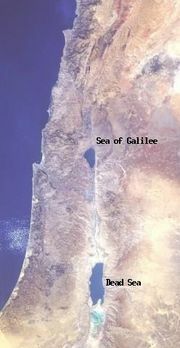 Its section north of the Sea of Galilee (Hebrew: כינרת kinneret, Arabic: Bohayrat Tabaraya, meaning Lake of Tiberias) is within the boundaries of Israel (disputed by Syria), and forms the western boundary of the Golan Heights. South of the lake, it forms the border between the Kingdom of Jordan (to the east) and the State of Israel (to the west). In 1964 Israel began operating a dam that diverts water from the Sea of Galilee, a major Jordan River water provider, to the national water carrier, told Hillel Glassman, a stream expert at Israel's Parks Authority. Also in 1964 Jordan constructed a channel that diverted water from the Yarmouk River, another main tributary of the Jordan River. This resulted in great damage to the ecosystem. Syria has also built reservoirs that catch the Yarmouk's waters. In a year, the Yarmouk's flow into the Jordan River will dwindle to a trickle, once Syria and Jordan begin operating a dam they jointly built, he added. Environmentalists blame Israel, Jordan and Syria. The three countries replenished the river with sewage water, agricultural runoff and salt water, Glassman said. The freshwater foliage that once flourished along the river's banks has been replaced with saline vegetation. In modern times the waters are 70 to 90% used for human purposes and the flow is much reduced. Because of this and the high evaporation rate of the Dead Sea, the sea is shrinking. All the shallow waters of the southern end of the sea have been drained in modern times and are now salt flats. 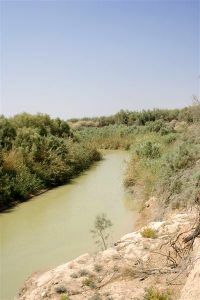 The waters of the Jordan are an extremely important resource to the dry lands of the area and are a bone of contention between Lebanon, Syria, Jordan, Israel and the Palestinians. Route 90 connects the northern and southern tips of Israel and parallels the Jordan River on the western side. In the Hebrew Bible, the Jordan is referred to as the source of fertility to a large plain ("Kikkar ha-Yarden"), called on account of its luxuriant vegetation "the garden of God" ( Genesis 13:10). There is no regular description of the Jordan in the Bible; only scattered and indefinite references to it are given. Jacob crossed it and its tributary, the Jabbok (the modern Al-Zarḳa), in order to reach Haran (Gen. 32:11, 23-24). It is noted as the line of demarcation between the "two tribes and the half tribe" settled to the east ( Numbers 34:15) and the "nine tribes and the half tribe of Manasseh" that, led by Joshua, settled to the west (Josh. 13:7, passim). Opposite Jericho it was called "the Jordan of Jericho" (Num. 34: 15, 35: 1). The Jordan has a number of fords, and one of them is famous as the place where many Ephraimites were slain by Jephthah ( Judges 12:5-6). It seems that these are the same fords mentioned as being near Beth-barah, where Gideon lay in wait for the Midianites (Judges 7:24). In the plain of the Jordan, between Succoth and Zarthan, is the clay ground where Solomon had his brass-foundries ( I Kings 7:46). In Biblical history the Jordan appears as the scene of several miracles, the first taking place when the Jordan, near Jericho, was crossed by the Israelites under Joshua (Josh. iii. 15-17). Later the two tribes and the half tribe that settled east of the Jordan built a large altar on its banks as "a witness" between them and the other tribes (Josh. xxii. 10, 26 et seq.). The Jordan was said to be crossed dry-shod by Elijah and Elisha (II Kings 2: 8, 14). Elisha performed two other miracles at the Jordan: he healed Naaman by having him bathe in its waters, and he made the ax of one of the children of the prophets float, by throwing a piece of wood into the water (II Kings 5:14, 6:6). The Jordan was crossed by Judas Maccabeus and his brother Jonathan Maccabaeus during their war with the Nabatæans ( 1 Maccabees 5:24). A little later the Jordan was the scene of the battle between Jonathan and Bacchides, in which the latter was defeated (I Macc. 9:42-49). The New Testament states that John the Baptist baptized Jesus in the Jordan (Matt. 3:13). Similarly, water from the Jordan River is frequently sent around the world for baptisms, particularly those of royalty.